The idea of taking something from New Orleans and bringing it to Seattle is a good one, though normally it requires going through an arduous arena approval process, kissing David Stern's ring, and pretending to get excited about potentially rooting for dudes named Marco and Greivis. 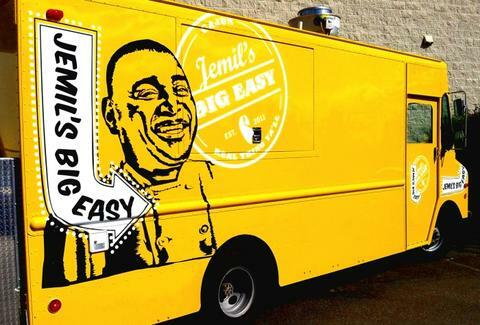 Importing something only slightly less ambitious than the Hornets, Jemil's Big Easy. This bright yellow mobile eats slinger is serving up "the real thing, y'all", aka traditional Big Easy edibles prepped by an NO native with serious international cooking chops (he's won awards for his Crawfish Beignets, what have you done?!? ), along with some help from a fellow cooking instructor at Coyote Central, whom he presumably decided to recruit after their working relationship failed to turn Ugly. JBE's specialties include red beans and rice w/ sausage; etouffee w/ crawfish, shrimp, chicken or catfish; and a traditional rice-based Jambalaya, a name derived either from the French word for "mish-mash", or the Stuart Scott catch phrase for "this catch phrase isn't very good". Crescent City-style sandwich options include orig' Muffalettas served on round Sicilian bread, and po' boys featuring oysters, shrimp, or roast beef, which really should be resolved by now, as Easter was, like, five days ago, and Aunt Vicki already agreed to split the leftovers. Ancillary offerings include chicken or sausage gumbo, sides like fried okra & Cajun cornbread, and even daily dessert specials like peach cobbler and bread pudding w/ a whiskey sauce, though if you point out that the former is just a type of the latter, you can expect a Stern talking to.